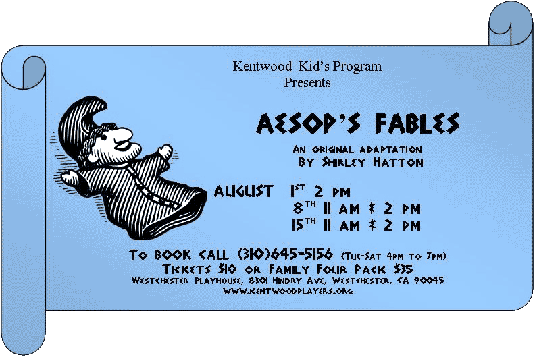 Several of Aesop’s classic fables get a new twist in this fresh, funny script written by Kentwood Players member Shirley Hatton. The story begins when Aesop announces that he needs his workshop cleaned for the dignitaries that are coming for a visit. While cleaning the workshop, the young apprentices learn lessons that help them along their journey. And with an order-barking boss laying down the rules, these youngsters will need all of the help they can get to reach their goal before the time runs out. The production is directed by Jordan Bland and assistant directed and produced by Adam Dunberger. Drew Fitzsimmons takes on the backstage role of stage manager. Featured in the cast are Marcy Agreen, Amanda Araque, Colette Araque, Liliana Brown, Madison Browning, Makenzie Browning, Gypsy Foster, Logan Gould, Trinity King, Kobe Kubes, Brittany Lundquist, Victor Mashevsky, Francesca Palermo, Jaren Rhodes, Valerie Ruel, Alan Trapenard – and PUPPETS!